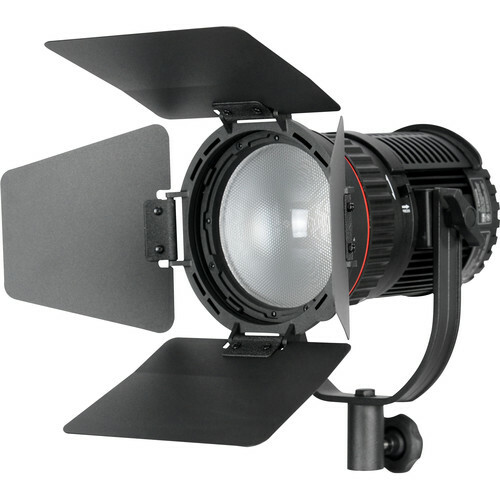 The CN-30FC Bi-Color LED Fresnel Light from Nanguang is a versatile light source with impressive control features at a price point that makes it a wise choice for both part-time and full-time shooters. The light has color that's CRI-rated at 95 for accurate rendering and variable from 3200 to 5600K to meet any ambient light challenge or to blend in seamlessly with other fixtures. The beam angle of this Fresnel is adjustable from 12 to 55 degrees to offer both wide coverage and long-throw spotlight use. The output can be further shaped by the included barndoors. Light intensity is variable too from 0 to 100%, while the fixture's quiet air-cooling is an asset, especially in sound-sensitive situations. The CN-30FC is ready for worldwide use thanks to its 110-240 VAC power adapter. A fitted case is provided for storage and transport.